The Leadership Fellows Program at Harvard Business School is based on University Professor Michael Porter’s vision of developing a network of HBS graduates with cross-sector experience who are committed to addressing societal issues throughout their careers. The Fellowship is a two-way commitment in which graduating students are offered once-in-a-lifetime opportunities to experience high-impact management positions in nonprofit and public sector organizations for one year at a competitive salary. At the same time, the hiring organizations leverage the experience, energy, and strategic and analytical skills of MBAs in roles that produce immediate results and build long-term capacity. Since its inception in 2001, the Leadership Fellows Program has placed 208 Fellows at organizations such as the City of Boston Mayor’s Office, Harlem Children’s Zone, Mercy Corps, Whitney Museum of Art, World Wildlife Fund, and the U.S. Department of Education. “The HBS Leadership Fellows Program provides a one-of-a-kind opportunity for our MBAs to work directly with the CEOs, senior executives, and elected officials leading the world’s pre-eminent organizations in the public and social sectors,” notes Matt Segneri (MBA 2010), Director of the HBS Social Enterprise Initiative. 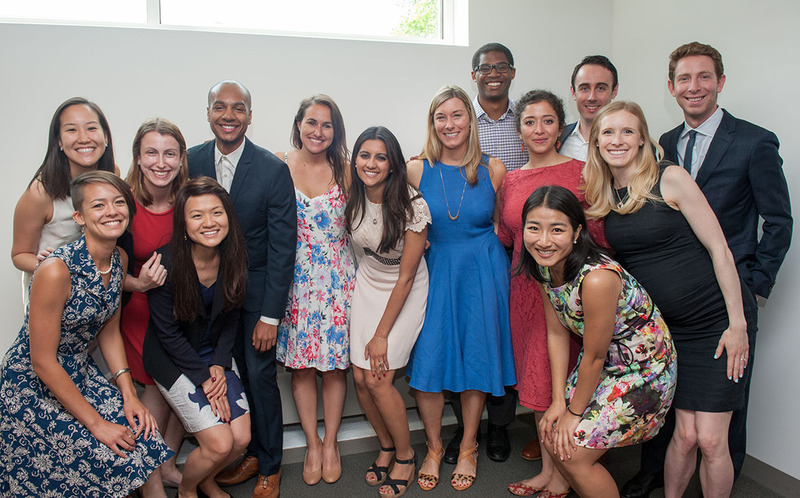 “They take on top-priority projects and tackle some of society’s toughest challenges within weeks of graduation.” Segneri spent his own Leadership Fellows year in the City of Boston Mayor’s Office and continued his career in social enterprise at Bloomberg Philanthropies before returning to HBS. Whether Fellows stay on with their sponsoring organizations, move to another social enterprise, or enter the private sector, past participants agree that the Leadership Fellows Program is critical to their ongoing development as leaders who make a difference in the world. Hear from the Fellows in their own words about why they are excited about their upcoming opportunities. Harvard Business School is grateful for the generosity of donors who have been vital to the HBS Leadership Fellows Program: James A. Attwood, Jr. (MBA 1984) Fellowship, David J. Dunn (MBA 1961) Fellowship, Horace W. Goldsmith Foundation/Richard L. Menschel (MBA 1959) Endowment, Richard Lumpkin (MBA 1963) Dean’s Discretionary Fund, Margaret T. Morris Foundation Endowment, Carl and Lily Pforzheimer Foundation Fellowship, Michael E. Porter (MBA 1971) Service Leadership Fellowship, and John C. Whitehead Fellowship for Not-for-Profit Management. About the Social Enterprise Initiative: The HBS Social Enterprise Initiative applies innovative business practices and managerial disciplines to drive sustained, high-impact social change. It is grounded in the mission of Harvard Business School and aims to educate, support, and inspire leaders across all sectors to tackle society’s toughest challenges and make a difference in the world.